Japanese bond investors’ latest overseas trip might flop, just like last summer’s foray. That’s bad news for the investors and for Tokyo’s anti-deflation campaign. Last year it was the U.S. Federal Reserve’s taper talk which discouraged Japanese investors from seeking better returns away from home. Shortly after the Bank of Japan announced its unprecedented stimulus, the Fed spooked markets by heralding the end of its outsized dollar-printing programme. Despite rising inflation expectations in Japan, the much-awaited deluge of newly minted yen into global bond markets never materialised. Now emerging market blues are threatening another overseas journey. Though investors have been venturing back into foreign markets since the final quarter of 2013, they are still hesitant. The six-month average of net bond outflows from Japan was 1.7 trillion yen ($16 billion) in December, half the level seen before the European debt crisis turned ugly in late 2010. Japanese investors face a tough choice. Putting money to work overseas means braving emerging market jitters. Staying at home requires them to hold 10-year Japanese Government Bonds which yield 0.6 percent when long-term inflation expectations are already above 2 percent. Jumping into domestic equities is one escape route, and Prime Minister Shinzo Abe is pushing the largest public pension fund in that direction. But other debt investors may not have that choice. 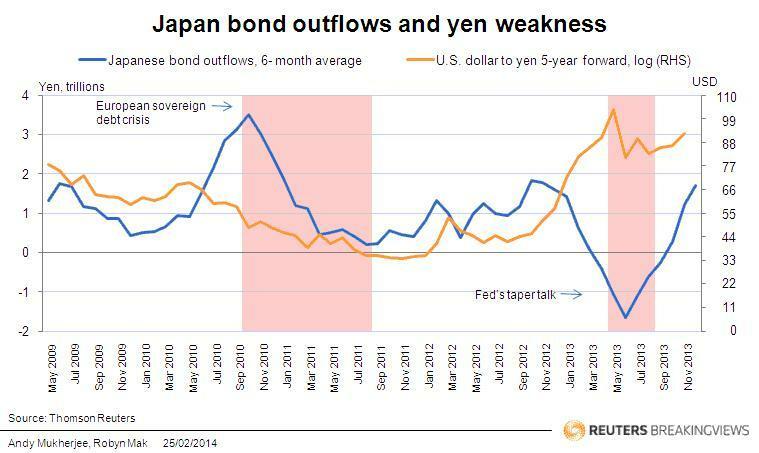 Investors’ reluctance to travel is also a problem for the Bank of Japan. The central bank would be happier if Japanese money had been scrambling to switch out of domestic government bonds. Yen leaving home would cheapen the currency, pushing up export earnings and hopefully leading to a sustained revival in domestic investment and wages. As long as the BOJ is scooping up government bonds, there’s no reason to worry about a disorderly selloff. About 15 percent of the government’s outstanding liabilities are already in the central bank’s vaults. For both the BOJ and Japanese investors, emerging market turmoil has come as a party pooper. If it worsens, the authority may have no option but to further boost its stimulus and push government bond yields down to such painfully low levels that investors are forced to run out the door. Japanese investors’ net outbound investment in overseas bonds and notes was 313 billion yen ($3 billion) last year, a steep decline from 17 trillion yen in 2012, according to government data. The yield on the 10-year Japanese government bond was 0.6 percent on Feb. 24, down from 0.93 percent on May 29 last year. The Japanese yen traded at 102.51 against the U.S. dollar.